As part of a full-house renovation, the Robinson family have created a luxurious new space out of a small guest bedroom. The new bathroom has true eco credentials and includes a bespoke shower enclosure and twin basins. As part of a full-house renovation, the Robinson family have created a luxurious new space out of a small guest bedroom. ‘When we began renovating our house, we soon realised that the one thing it lacked was a large family bathroom, and with two small sons that was absolutely essential. We’d been in London for years and longed to move to the country. We looked at Devon and found this house. ‘Right from the outset, we knew the bathroom would be a challenge, as the space had once had a fireplace in the corner. As a result, one of the walls was uneven and there was no plumbing connected in here. ‘It was not a large room and we wanted it to feel as spacious as possible, so we decided to get professional design advice. We enlisted the help of Joe Mühl, the senior interior designer at Ocean Bathrooms. This is a local firm that sells bathroom fittings with an eco focus. ‘Joe created a computer-generated layout for us, to give us a sense of what the finished bathroom would look like. We were then able to make suggestions before we settled on the final design. ‘Our main priorities were to have a luxury bathtub, a double shower cubicle and twin washbasins. As we wanted to include the latest energy and water-saving fittings, we were really pleased to discover that there were plenty of stylish options available. ‘We chose special water-saving showerheads, called Raindance from Hansgrohe. Hi-tech air injection makes the water droplets larger for a really luxurious feel and the result is that it uses around ten per cent less water than a standard showerhead. We also chose water-saving taps and a chromatherapy spa bath by Airbath. This has built-in colour-changing lights for a relaxing effect – an extra touch of luxury. ‘In order to save money, Malcolm did all the stripping out and the first fix on the taps, basins and toilet, as a while back he’d done a plumbing course. But we needed new plumbing and a soil pipe installed as well, so Ocean Bathrooms put us in contact with Mark Howells’ design team to complete the installation. The twin showers were fitted in a glassfronted enclosure designed to fit in the far corner, which works well with the awkward shape of the wall there. ‘We also hired a local carpenter and tiler to work unsupervised and so save us commuting back and forth from London. Using our car less helped us to keep the project as eco-friendly as possible, too. ‘Before we decided to move out to Devon for an all-new lifestyle, we both had jobs in the city that involved a lot of foreign travel. We loved the luxury feel of the hotels where we’d stayed during business trips.’ The couple decided they wanted to recreate the hotel bathroom style in their new family home. 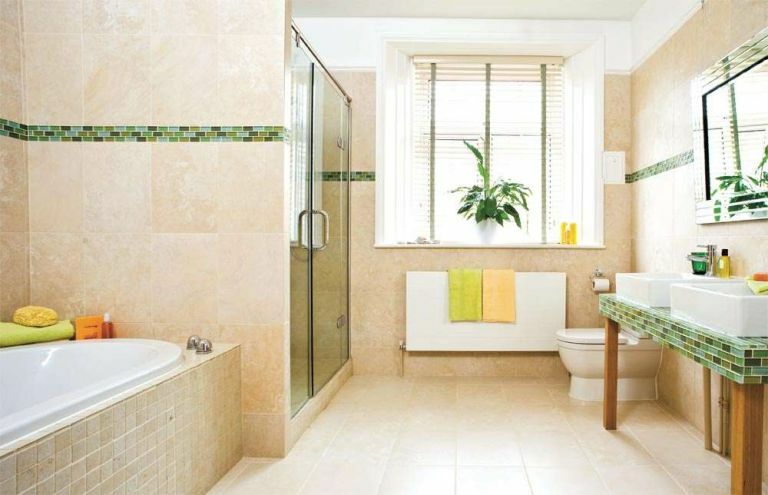 ‘Limestone tiles were our preferred choice for the floor and walls, but we didn’t want the room to look bland, so we added some striking green glass tiles and smaller limestone mosaics to create contrast and texture. ‘I couldn’t find a unit that I liked for our twin basins to sit on, so we had our local carpenter custom-make a washstand for us to fit the space. The tiler then finished it with tile sheets with small green glass mosaics, matching the stripe that runs right round the room. ‘The bathroom took about a year to completely convert and install, but as the rest of the house was being renovated at the same time before we moved in, it wasn’t a problem. And Malcolm and I are both really pleased with the result. ‘We set out to create a large, luxurious family bathroom with the highest possible eco spec – and that’s exactly what we’ve achieved. The bathroom is every bit as stylish and relaxing as the ones we remember from hotels on our travels. And all our guests love it, too.